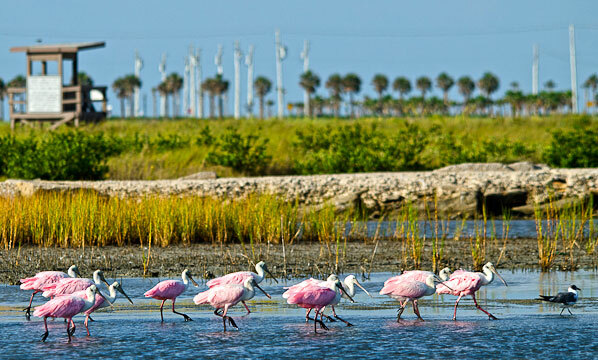 The Galveston Island Nature Tourism Council is wild about Galveston, and with good reason! 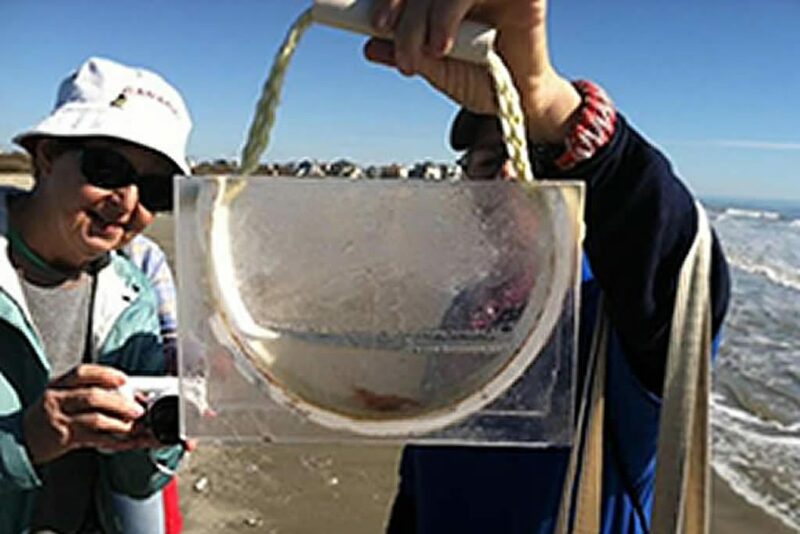 Our historic beach town on the Gulf of Mexico offers engaging natural wonders in every sector of the island and its surrounding areas, every month of the year. We know, because we help connect people with nature experiences and outdoor adventures. 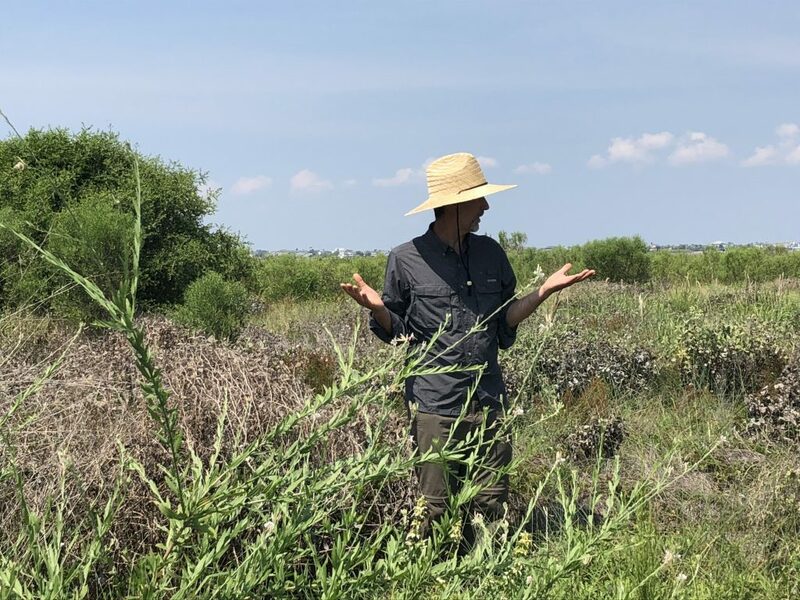 We invite you to explore this website and learn about our nature-related events and programs, and how we promote the value of natural habitats and resources in the Galveston area. 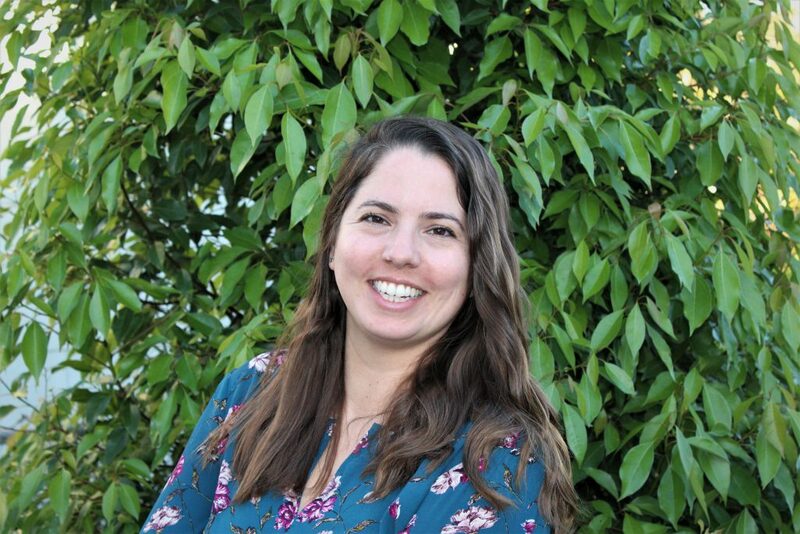 We’re proud to welcome our new Project Coordinator, Anna Deichmann, to the GINTC family! 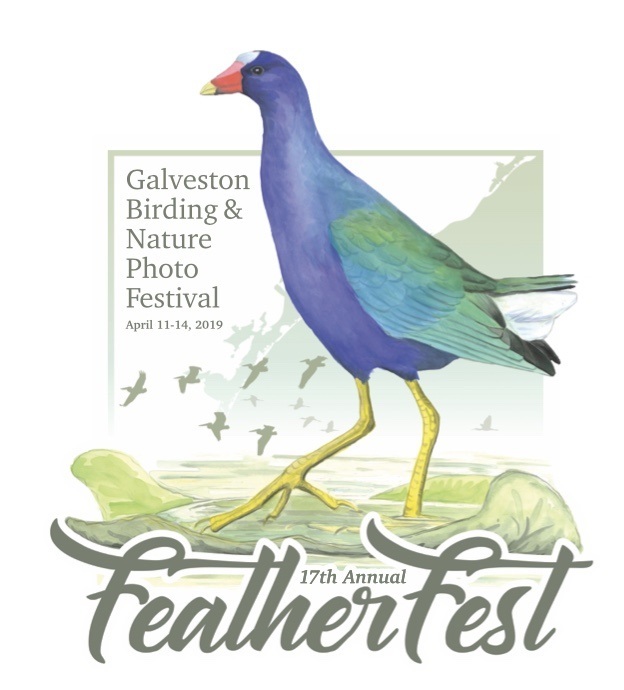 Previously Land Stewardship Coordinator for Galveston Bay Foundation, her GINTC career is off to a flying start with FeatherFest just around the corner. Be sure to give her a shout-out when you see her in the office and about town! 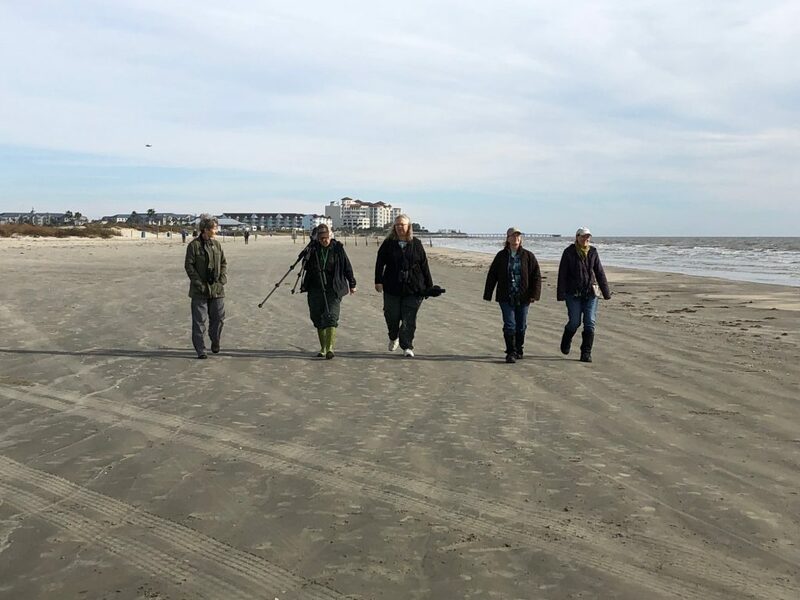 The 2018 Galveston CBC reported 158 species of birds which were found by 53 people 0n Dec 18, 2018 birding from 6:30 AM to 530 PM on a partially cloudy to clear day with temperatures ranging from 50 to 65 degrees Fahrenheit. 158 species is in line with 4 of our last five years but is below our 12 year average of 162 species. We reported all time high numbers of Hooded Mergansers, Tree Swallows and Wilson’s Plover and an all time low of American Wigeon. Significant misses were geese of any species, Black-bellied Whistling Ducks, Redhead Ducks, Dark Ibis, Bonaparte’s Gull, Barn Owl, Field Sparrow and House Finch. Unusual birds fond in 2018 were Tufted Titmouse, Summer Tanager, Dark-eyed Junco, White-winged Scoter, Great Kiskadee, Yellow-throated Warbler, and Scissor-tailed Flycatcher. I expect the count species total to stay at the last 5-year average or go lower in future years. My basis for this is the continued loss of habitat in the count circle due to urban and commercial/industrial growth. Secondly, there is no longer any rice farming in Galveston County and all agriculture has greatly diminished. 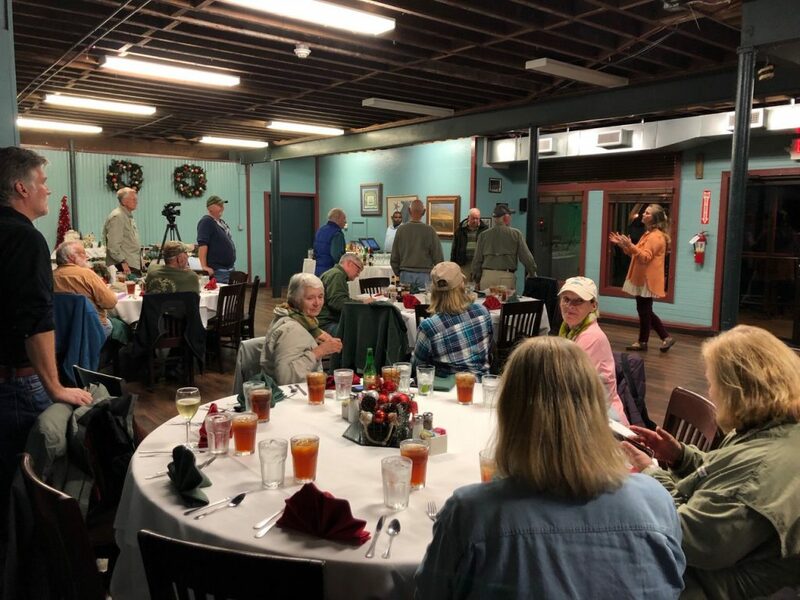 Special thanks to the Galveston Island Park Board of Trustees for sponsoring our Christmas Bird Count Dinner! BRINGING GALVESTON’S LOST BIRD HOME! One of the last times anyone saw an Eskimo Curlew anywhere in the world was right here on Galveston Island more than 50 years ago. The Eskimo Curlew Memorial belongs in Galveston, and we are grateful to all of you who have joined us in making that a reality. 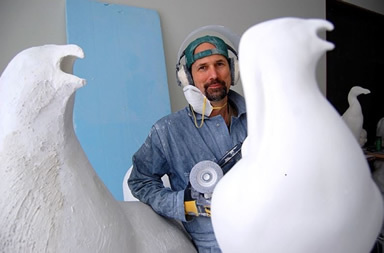 The Lost Bird Project is led by sculptor Todd McGrain. His impressive sculptures of extinct North American birds are permanently installed near the last sightings of each bird. Five sculptures have been placed: Great Auk in Newfoundland, Passenger Pigeon in Ohio, Labrador Duck in New York, Carolina Parakeet in Florida, and Heath Hen in Martha’s Vineyard. The Eskimo Curlew was last seen on Galveston Island in the early 1960s. We are bringing the Eskimo Curlew sculpture – an evocative and beautiful public art piece – home to Galveston where it will raise awareness of declining species, promote action, inspire us artistically, and remind us of our duty to protect natural resources. We invite you to read Forgetting is easy from Coast Monthly, compliments of the Galveston County Daily News, for more information and photos of earlier sculptures. The total cost of the project is $100,000, and we are happy to report that we have reached our goal! Sincere thanks to the individuals, families, foundations and the SAVYs at Moody Gardens for generously helping us bring this historic landmark to Galveston Island! Where will it land? Thanks for your suggestions for the perfect home for Galveston’s Eskimo Curlew sculpture. Artist Todd McGrain was enthusiastic about the sites he surveyed – we’ll let you know when plans are confirmed! 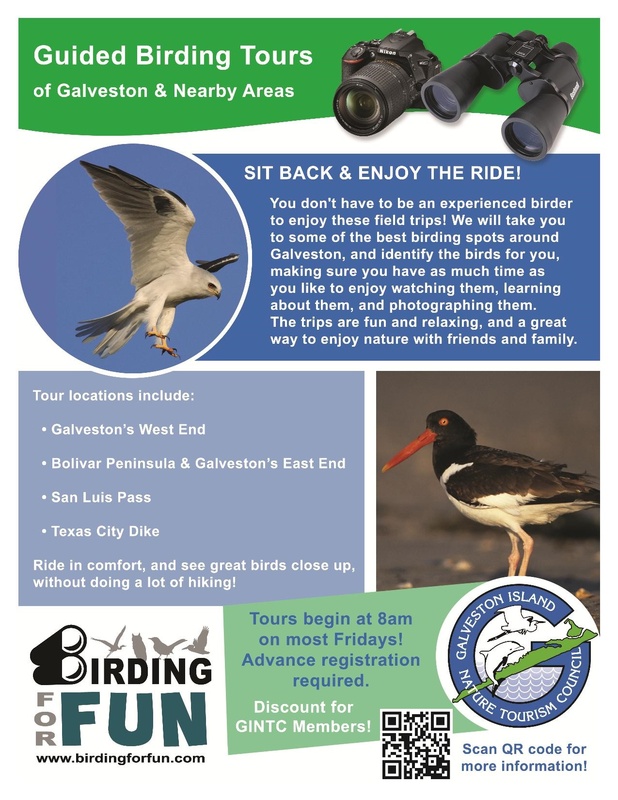 GINTC has partnered with Birding for Fun to offer regularly scheduled guided birding tours of Galveston and other nearby areas. The tours are led by Kristine Rivers, who has been an avid birder for more than 35 years. 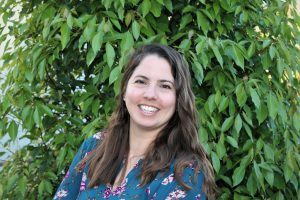 You may recognize her as one of the field trip leaders from FeatherFest, or from her years as an area leader on the Brazoria Columbia Bottomlands Christmas Bird Count. She is also the President of the Cradle of Texas Chapter of the Texas Master Naturalists. 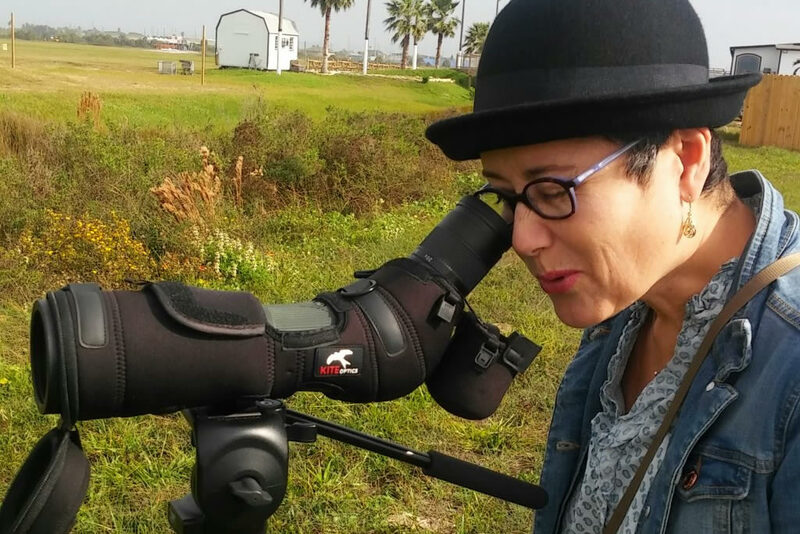 Kristine’s enjoyment of birding spills over to those who join her tours, as she still gets excited to see our beautiful Texas Gulf Coast specialty birds such as White-tailed Kites and Reddish Egrets, sharing her enthusiasm and delight as she explains their unique behavioral traits while watching them in action. Participants have described the experience as therapeutic – much different than other guided tours, because of Kristine’s patience in pointing out the birds and answering questions, ensuring that everyone has had a chance to see the birds before moving on to the next area. The 2018 tours will be scheduled every other week on Fridays, sometimes more frequently, and destinations vary each time so that participants have the opportunity to see as many different species as possible. 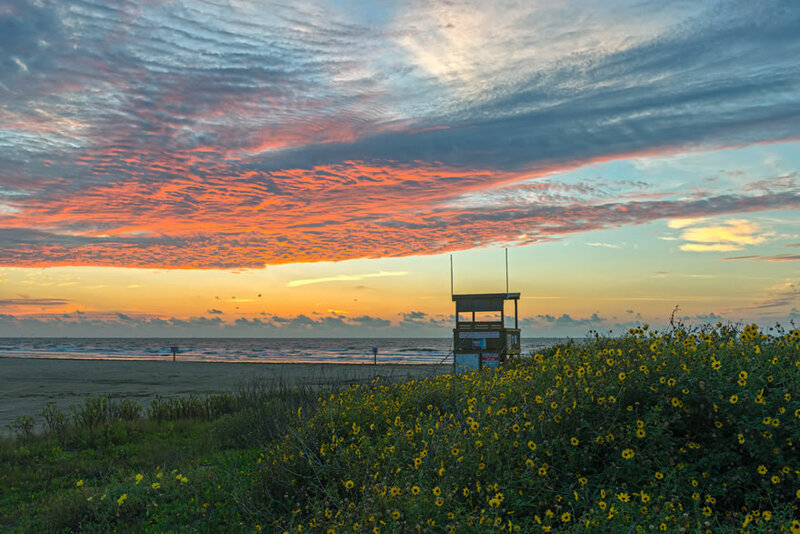 Destinations include Galveston’s West End; Galveston’s East End and Bolivar Peninsula; San Luis Pass; Texas City Dike; and Surfside/Quintana. Participants ride in air conditioned comfort in summer months, and heated comfort in winter months, enjoying seeing birds up close without doing a lot of hiking. 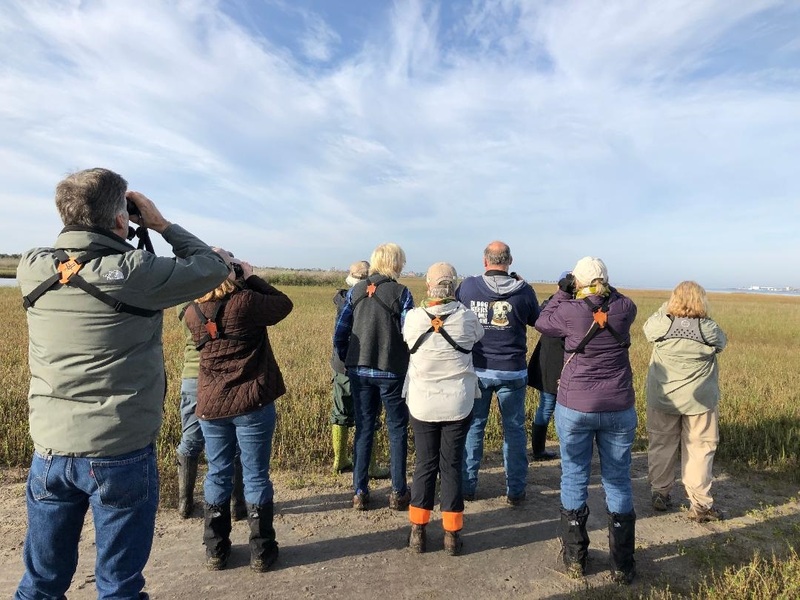 This makes these tours the perfect birding experience for those who are not sure about spending a lot of time outdoors, or for those who have physical limitations. You are sure to enjoy yourself whether you are a new or experienced birder, a nature lover, or a photographer looking for new photo opportunities! GINTC members get a discount. Check here for the Birding for Fun field trip schedule. Things you might do & see with GINTC! We offer a wide array of unique and fun nature activities throughout the year. 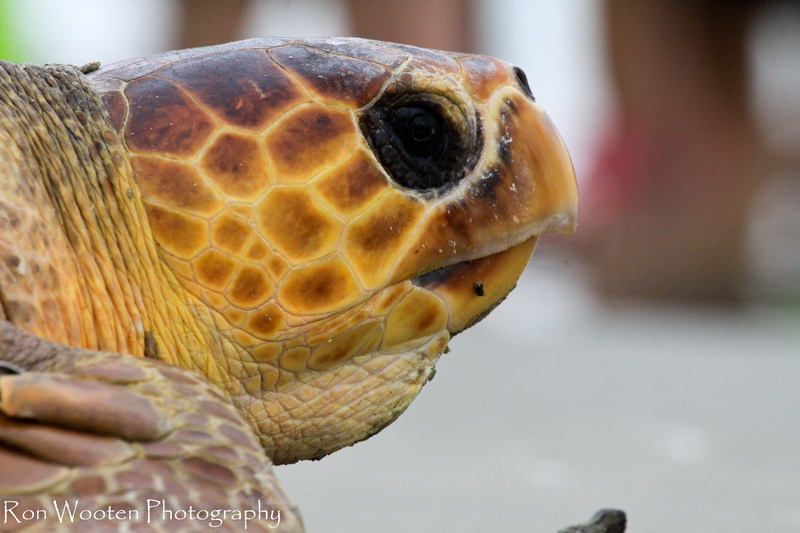 Annual events include Sea Turtle Saturday in February, Galveston FeatherFest in April, and Holiday with the Cranes in December. Our Winter Nature Program includes activities designed for visitors and residents who love to explore nature during the winter months of January and February. The program includes indoor and outdoor activities such as birding outings, sea turtle talks, behind the scenes peeks at Moody Gardens and more. Click here for our 2019 schedule of winter activities! 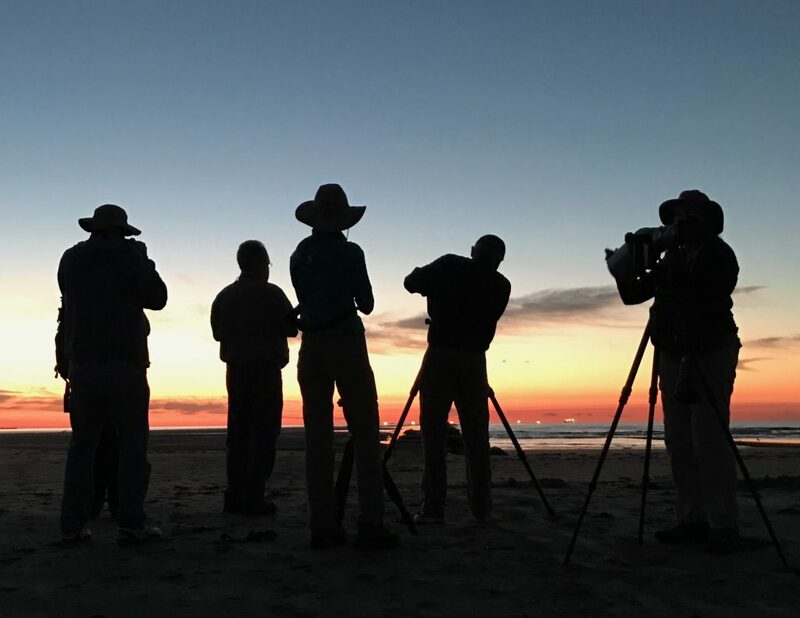 Through our partnership with the Galveston County Audubon Group, we offer free birding outings once a month from September – May and quarterly birding presentations at Rosenberg Library. The Galveston Island Nature Tourism Council thanks our members and volunteers, the City of Galveston, Galveston Park Board of Trustees, Galveston.com, and corporate members Affaire d’Art International Fine Art Gallery, Casa del Mar Beachfront Suite, Coronado Palms Coastal Cottage, IPM Asset Solutions, McMac Commissioning Services, LLC., Moody Gardens, Sand ‘N Sea Properties, Tom Schwenk, Realtor, and SOAR Vacation Rental Services, for supporting our efforts throughout the year. 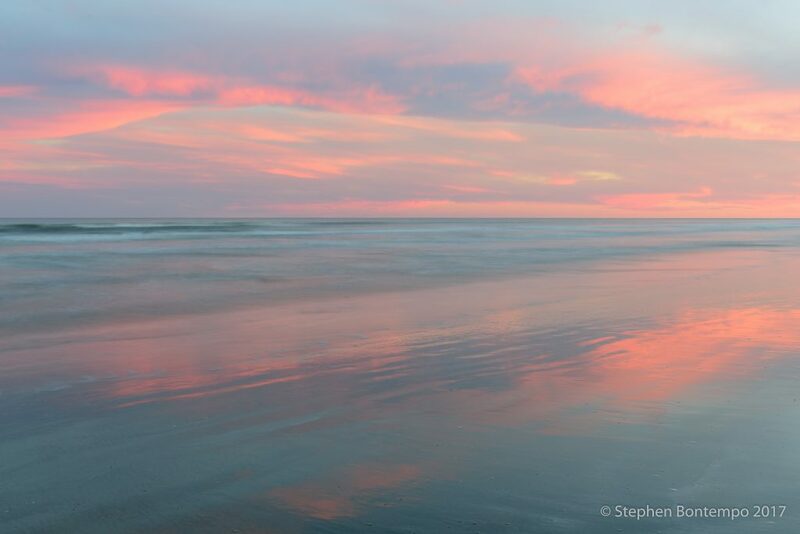 Special applause also goes to David Alaniz, Hector Astorga, Stephen Bontempo, Stan Bravenec, Anja Borski, Trudy LeDoux, Scott Meyer, Lisa Nelson, Barbara Rabek, Vadim Troshkin, Patrick Welsh, Bonnie White, Ron Wooten, and others for generously sharing their beautiful photography with us.